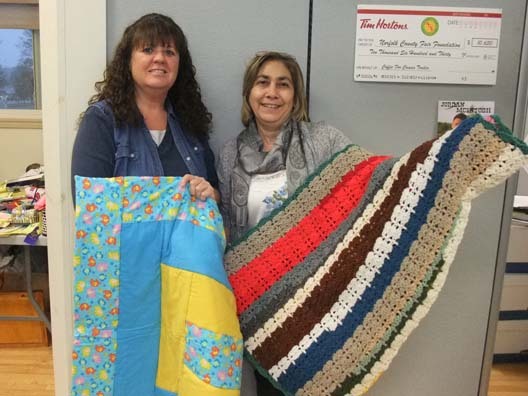 Shown in picture from left to right is Cheryl Mason and Anna Maerz displaying a lovely quilt and knitted blanket. These creations are part of the Community Service Project, Division 438 of the Norfolk County Fair and Horse Show. The security blankets and quilts are created with the intention of becoming a donation. We are very lucky to receive this donation especially during the month of November, which is Adoption Awareness month. They will be given to children as they go to their “forever homes”.